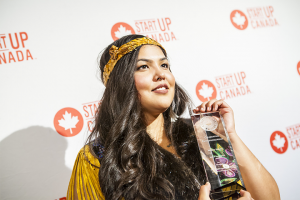 Startup Canada and Business Development Bank of Canada (BDC) have partnered to launch the Startup Canada Awards Alumni Program to bring together, tell the stories, and foster a community of influence and excellence amongst the recipients of the Startup Canada Awards. Every Alumni has demonstrated excellence and has made an enduring impact in advancing Canadian entrepreneurship.The Startup Canada Alumni Program is a platform to elevate their ongoing impact for Canada and to provide inspiration for the next generation of Canadian entrepreneurs. Alumnus receive an emblematic pin are elevated as thought leaders in policy discussions, as speakers inspiring the next generation, and as representatives of the Canadian entrepreneurship community to decision makers. Through the Alumni Program, they connect with each other through VIP in-person events and access a curated network of support to continue to advance their growth and impact. In partnership with StartupNews.ca and BDC, Startup Canada is celebrating the National Recipients of the Startup Canada Awards since the program's inception through a digital publication and campaign entitled 'Canada's Entrepreneurship Icons', launching during Global Entrepreneurship Week 2017. Click to see 2018 ‘Canada’s Entrepreneurship Icons’.